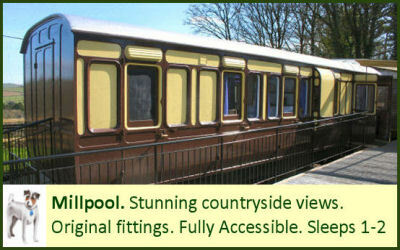 For those with mobility problems, our fully accessible coach Millpool would be our top recommendation. 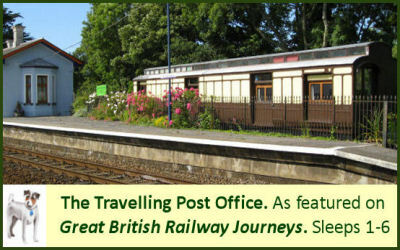 However the Travelling Post Office is also suitable for some as there is a ramp to the door. We can also provide a mobility scooter, toilet seat support frame and a stool for the bathroom upon request. Mevy has a steeper ramp and a step into the carriage. Please be aware that railway carriages are confined spaces, and we have to work within that. 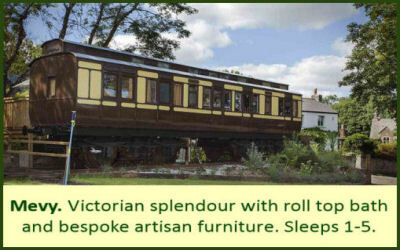 If you are particularly tall, then you may find our carriages unsuitable, as there will be places the ceilings are low, and the beds are only a standard double long, often with no space to extend the legs. Please let us know if you would rather have soya milk, dairy free or gluten free choices in your welcome pack, as this can be arranged. If there is else you need that is not listed, do please ask and we'll do our best to provide. 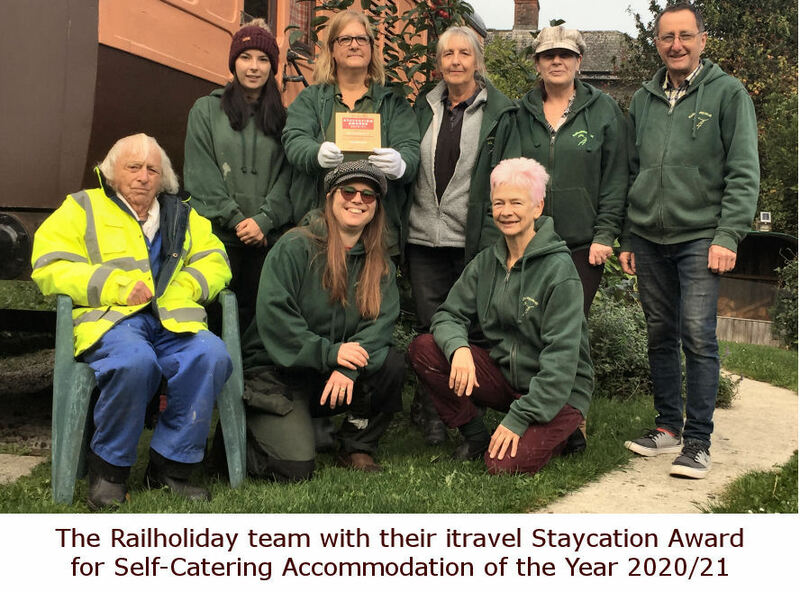 In Cornwall and Devon we have an excellent Countryside Mobility Scheme providing safe, enjoyable and easy access to the South West's countryside and visitor attractions for anyone who has difficulty walking, through an off road mobility scooter hire scheme. The closest schemes to St Germans are Siblyback Lake and Lanyhydrock, the closest to Hayle is at St Michael’s Mount. For specific carriages, please click on the images below. The nearest bus stop is over the footbridge and 100 metres away. The community village shop and post office is open from 8-1, then 3-6pm on weekdays, weekends 8-12 and is accessible to wheelchairs. The friendly staff will help if needed. Veterinary surgery - Albert Cottage - 66 Liskeard Road, Saltash PL12 4HG - 01752 843 397. Saltash Mobility Ltd - Unit 18, Saltash Business Park, Forge Lane, Saltash, PL12 6LX &dash; Tel: 01752 845265. Food 4 my holiday offers chef selected local food, as well as all the basics, and delivers to anywhere in Cornwall; simply place your order before you arrive, and it will be waiting for you when you get here. Their web site is Food4myholiday or they can be called on 01503 240992. Our brochure for Railholiday and this access guide are available in larger print on request. In St Germans there will usually be someone around to offer assistance if needed. If you anticipate you may need help, please let us know so we can ensure there is someone to greet you. Parking is available for each carriage, and clearly marked. 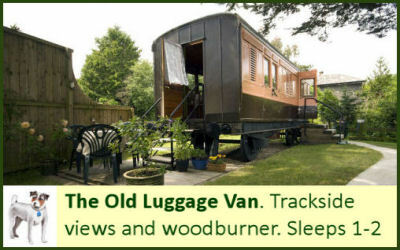 The car parking space for the Old Luggage Van is on the other side of the access road to the garden entrance, in front of the station building. 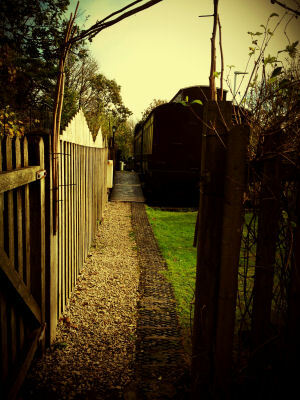 The road is uneven in places, and there is a very small step up into the Luggage Van garden. The path to the Old Luggage Van has a short moderate slope. The parking to Mevy is in front of the carriage. 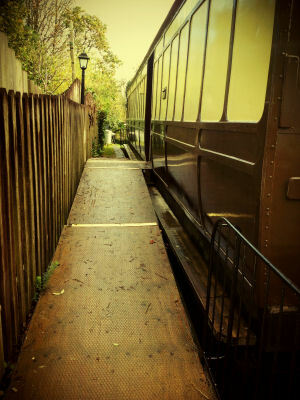 There is a short path and a ramp into the carriage. The car parking space to The Travelling Post Office is beside the garden gate. There is some additional off road parking on site. The parking area is tarmaced, and lit at night with low energy bulbs. The laundry/games room is accessed at via a short ramp through the outside play area, which has some uneven surfaces. The doorway is 75cm (29.5inches) wide. There is a washing machine and a dryer, both front loading standard domestic sized machines. The dryer is on top of the freezer. There is an upright freezer at ground level. The room is lit by a single, automatically operated wall light. An ironing board, mop and bucket, drying rack and umbrella are provided. There is an Air Hockey table measuring 148.5 cm (58 inches) in length. There is also a DVD cupboard games and tourist information. The main door of the Luggage Van is 2ft wide and the door on the end of the carriage is 24.7 inches (63.3cm). There are 3 wooden steps leading up to the main door with a handrail, and 4 steps up to the end door with handrails on both sides. There is an automatic light next to the steps. There is are door mats outside and inside the door to wipe feet on. The entrance way is approx 51 inches (129.5cm) wide and 6ft long. The walkway through the carriage is approx 34 inches (86cm) wide. The carriage retains its original wooden floor. 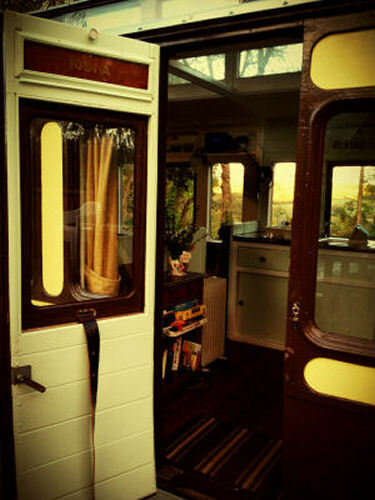 The lounge area is at one end of the carriage, with an exit door to the garden. There is an 18inch flat screen TV with built in DVD player. Windows and doors allow natural daylight, while artificial light is supplied by energy efficient ceiling lights. 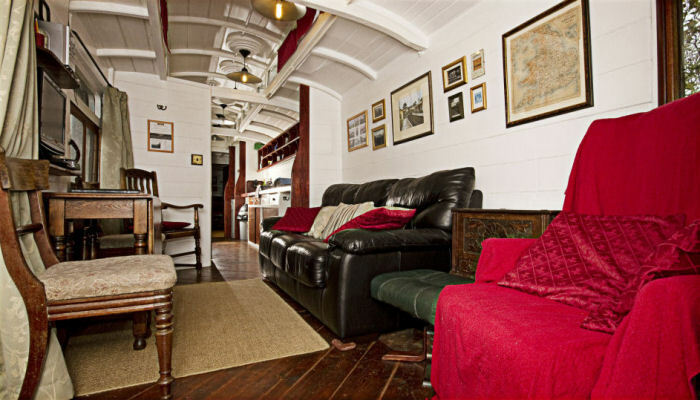 The lounge retains the carriage’s original wooden floor, with a rug measuring 51cm by 110cm. There are two movable armchairs. The kitchen area is beside the lounge. The passage measures 241cm (94 inches). The hob is 92cm (35.5 inches) above the floor and measures 48cm by 25cm. The microwave sits on a shelf 142cm off the floor. The worktop with sink and draining board is 241cm long. The fridge is under the counter, with the highest shelf in the fridge 50cm off the floor. Glasses and plates are 46cm off the floor, both stored in a cupboard. Crockery is in a drawer 73cm off the floor. Windows provide light in the day and ceiling spotlights and above work surface lights do so at night. 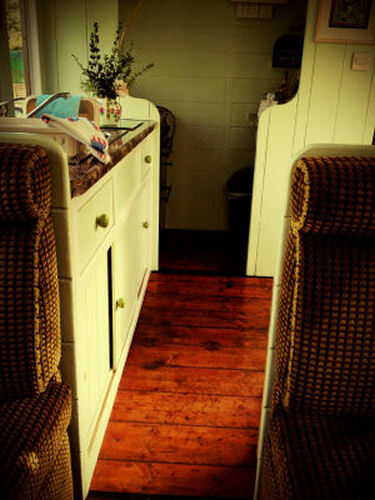 The kitchen retains the carriage’s original wooden floor. There is a double bed measuring 135x180cm. It is against the wall on one side. Windows and doors allow natural daylight, while artificial light is supplied by ceiling lights. All sleeping areas retain the original wooden walls, floor and ceiling. A clock radio with large digital display is beside the bed as is a touch sensative bedside light. All bedding is low allergy. All facilities have level access with no internal steps. The toilet door is 48cm wide. 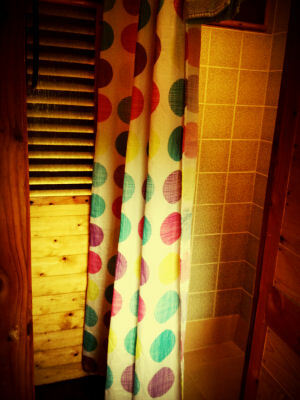 The shower room door is 48cm wide. The washbasin is 92cm off the floor. Light is provided by a strip-light above the mirror. 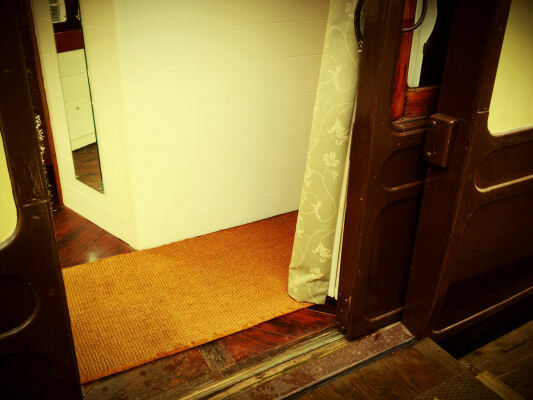 The toilet and shower room retain the carriage’s original wooden flooring. A shower mat is provided. The shower has a 23.5cm step into it. The carriage’s garden is 21m (69 feet) long and 10m (33 feet) wide at its widest point, 5m (16 feet) wide at its narrowest point. There is a raised flowerbed at one end, potted flowers and plants all around, as well as trees and wild flowers. The gardens are fully enclosed by hedges and fencing with gated access. A garden table and chairs are in place. There is a wooden deck area with a single plank bench. Our children’s play area is across the car park. The village play park is a 5-minute walk via pavements and down the steep access road. The main door is 66cm (26 inches) wide though it can open to 99cm (39 inches). There is one step up into the carriage, though a ramp can be put in place by request. The floor inside the entrance is the original wooden floor, with a 2m (79 inch) mat to wipe feet on. 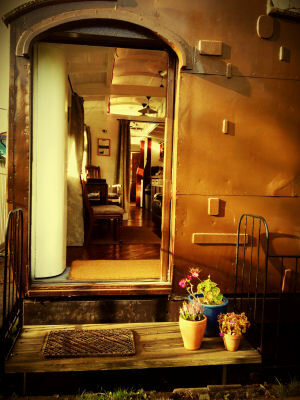 The main passageway through the carriage is 86cm (35 inches) at its narrowest and 2.2m (90 inches) at its widest. 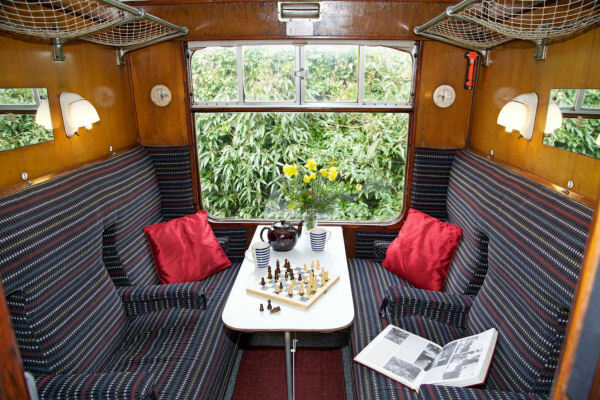 The lounge area is at one end of the carriage, with an exit door to the garden measuring 79cm (31 inches). The room has a fixed sofa bed and moveable armchair and dining chairs. The sofa is 53cm high. It can be used to make two single beds 6ft long and 65cm wide, or one double 6ft long and 130cm wide. There is an 18inch flat screen TV and DVD player. 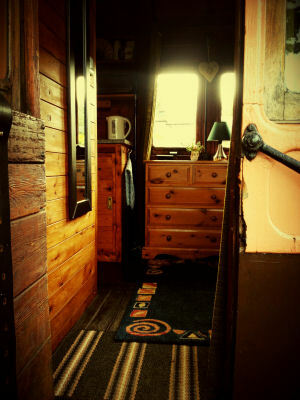 The lounge retains the carriage’s original wooden floor, with a coconut matting rug. There is a dining table within the lounge area, with the tabletop 74cm (29 inches) off the floor. There are 2 dining chairs and two carver chairs. The kitchen area is situated between the lounge and bedroom areas. There are no doors to the kitchen area. The hob is 94cm (37 inches) above the floor. The microwave is 1.5m (59 inches) off the floor. The worktop, with sink and draining board, is 94cm (37 inches) off the floor. The fridge is under the counter, with the highest shelf in the fridge 50cm (19.5 inches) off the floor and the lowest is 6.3cm (2.5 inches) off the floor. Glasses and crockery are 38cm (15 inches) off the floor. Cutlery is in a drawer 71cm (28 inches) off the floor. The main bedroom is at one end of the carriage. The double bed is 58cm (23 inches) off the floor and is fixed. There is 40cm wide access to both sides. A bunkroom is next to the main bedroom. The bottom bunk is 75cm (29.5 inches) off the floor and the top bunk is 157cm (62 inches) off the floor and is accessible by a ladder, and only suited to a child or agile adult. The connecting doorway between the bedrooms is 60cm (23.5 inches) wide. Windows and doors allow natural daylight, while artificial light is supplied by ceiling lights and individual bedside lights in each room. The double bedroom has a shared bedside lamp. All sleeping areas retain the original wooden walls, floor and ceiling. The walls are painted white in the double bedroom and pale green in the bunkroom. There is good contrast between the floors and walls. 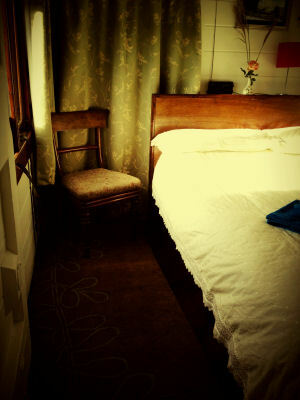 The bedrooms each have a rug, beneath which is the original wooden floor. All bedding is synthetic and low allergy. The toilet and shower room have level access with no steps. The toilet door is 52cm (20.5 inches) wide. The shower cubicle has a 28cm (11 inches) step into it. The toilet is 40cm (15.5 inches) high. The washbasin is 80cm (31.5 inches) off the floor. Light is provided by ceiling lights. 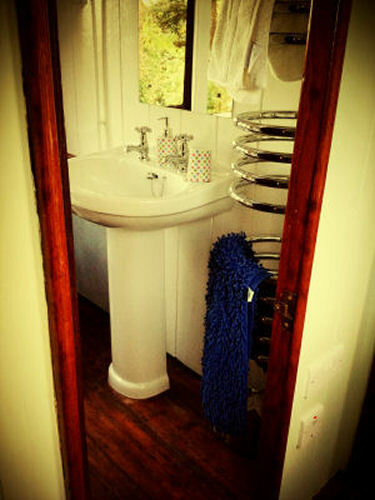 The bathroom/toilet retains the carriage’s original wooden flooring. A shower mat is provided. 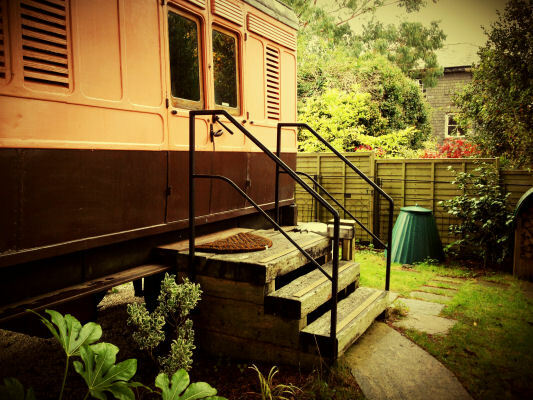 The front carriage garden is 2.4m long and 2.1m wide. The back garden is 2.1m wide by 5m long. There are flowerbeds and potted plants all around, with a small lawn space at each end of the carriage. The ramped walkway alongside the carriage between the two gardens is 90cm wide. A garden table and chairs are in place at one end of the carriage. Our children’s play area is beside the TPO garden. The village play park is a 5-minute walk via pavements and down the steep access road. A smoke alarm for the deaf can be provided on request. A mobility scooter is also available on request. Dogs are welcome for an additional cost. Guide dogs are free. Many of the carriage’s original features have been retained and restoration has been sympathetic towards original and authentic specifications. The mobile phone reception in the area is good. The nearest A&E unit is 10 miles away at Liskeard Hospital. The nearest doctor’s surgery is a few minutes walk away, the nearest vets is 8 miles. Additional information and phone numbers are available in the welcome book. 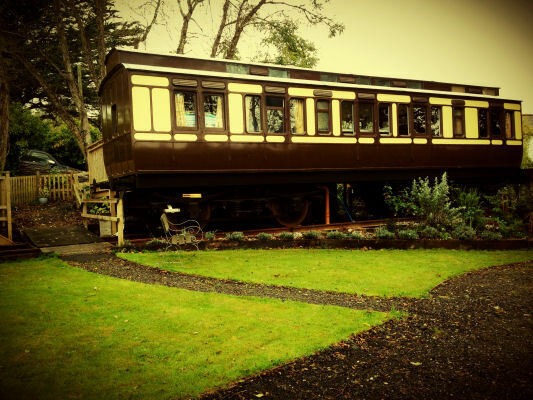 There is comprehensive information of local attractions, restaurants and events in the carriage, as well as on our website. There is parking in a carpark directly in front of Mevy. There is a slope with handrail up to the deck which runs almost the entire length of the carriage. There is a step up into the carriage of approx 20cm. There are small lawns on either side of the path to Mevy and a flower bed with pollinater friendly plants in front of Mevy. The Main door is 57 cm wide. In each room the ceiling is 1.8m high at the lowest point of the clerestory, and 2.6m high in the centre of the room. The entrance hallway area is 170cm wide x 183 long. The kitchen area is in this space. The kitchen area consists of a sink and worktop/cupboard space, measuring 168cm long x 90 cm high. There is a further small enclosed space, with a doorway of 55cm wide. This area houses the oven and fridge. The distance from the floor to the top shelf in the fridge is 45cm. The distance from the floor to the oven is 45cm. The distance from the floor to the grill is 70cm. There are no internal stairs. The carriage is all on one level. The toilet door is 50cm wide off the side of the corridor. The toilet is 45cm high. The washbasin is 82cm off the floor. The bath is 56.5cm high and has a shower over it. There is a wooden stool approx 14cm high to assist accessing the bath/shower. There is an anti slip mat to go in the bath. Light is provided by a light over the mirror and overhead lights and the switch is outside the room to the left of the door. There is a shaver socket and extractor fan which are live when the lights are on. The main bedroom is at one end of the carriage. The double bed is 53cm off the floor and is fixed. 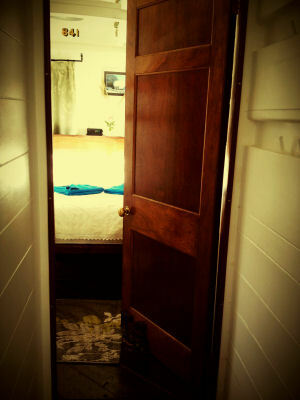 The door into the double bedroom is 50cm wide. The Double bed is a standard double size. Windows and doors allow natural daylight, while artificial light is supplied by ceiling lights and individual bedside lights. There is an Axminster wool carpet. There are three bunks in the bunk room. The top and bottom bunks are 5’7" long and 2’6", the middle bunk is 6’3" long and 2’6" wide. The bunkroom is at the opposite end of the coach to the main bedroom. 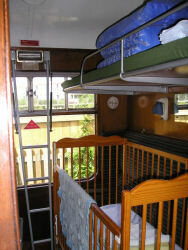 The bottom bunk is 39cm off the floor, the middle bunk is 110cm off the floor with ladder access. 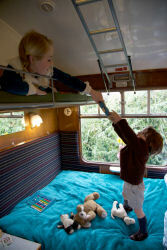 The top bunk is 170cm off the floor and is accessible by a ladder, and only suited to a child or agile adult. The doorway into the bedroom is 50cm wide. Windows and doors allow natural daylight, while artificial light is supplied by ceiling lights and individual bedside lights in each room. The bedroom either has a single adjustable bed or a conventional double depending on what was specified when booking. The bed can be positioned and made up to have the head of the bed to the right or left as required. The bed is aligned along the length of the carriage. The single bed measures 90cm x 2m x 63cm high. It can be positioned either against the wall to give a clear space to the side of the bed of 1.3m or it can be moved away from the wall to allow access on foot around the bed with a consequent reduction in clear space to 90cm. The nearest bus stop is 100 metres away at the bottom of a steep hill. 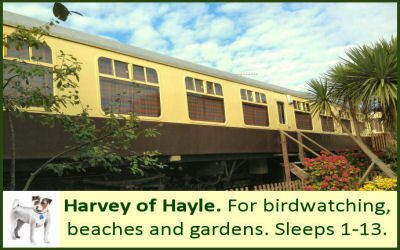 Hayle is well served by buses to St Ives, and the towns and villages of West Cornwall. The two main service providers are Western Greyhound and First Great Western. Western Greyhound buses are small and not equipped with wheelchair access. First Great Western have some coaches with disabled access. For more information, visit the website http://www.firstgroup.com/ or call Traveline on 0871 200 22 33, who will also be able to advise of other public transport providers. The entrance road to the station is tarmacked, and fairly steep in places. The nearest Shopmobility is in Penzance &dash; see contact details at the end of this statement. Food 4 my holiday offers chef selected local food, as well as all the basics, and delivers to anywhere in Cornwall &dash; simply place your order before you arrive, and it will be waiting for you when you get here. Their web site is Food for my Holiday or they can be called on 01503 240992. Our brochure for Railholiday and this access statement are available in larger print on request. There is a key box beside the entrance door, and details of the combination will be sent with your confirmation. At Hayle our caretaker is very helpful and can be contacted on 07970 499291. If you anticipate you may need help, please let us know so we can ensure there is someone to greet you. Parking is available for up to three cars. The surface is granite chippings. The main door of Harvey is 55cm wide and opens outwards. There is a handle to keep it open if required. The door to the East End deck is 63cm wide and opens inwards. There are 7 wooden steps leading up to the main door with a handrail on both sides. There is a step down to the outside deck and 6 steps up to the viewing tower, with handrail on the right. There is low level lighting on the outside of the carriage. There is a mat just inside the door to wipe feet on. The entrance way is approx 73cm wide and 253cm deep long. 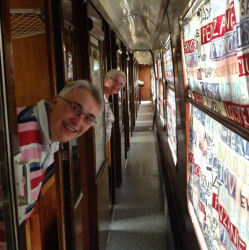 The corridor through the carriage is 57cm wide. The floor covering is lino. There door into each compartment slides and is 55cm wide by 190cm high. The compartments are all the same size, 190cm by 190cm. Please be aware that if you are very tall that the beds may be too short for comfort, as the matress is a standard double, with no space to extend the feet beyond the end. Windows and doors allow natural daylight, while artificial light is supplied by energy efficient ceiling lights. There are also two individual lights on each wall. The lounge/diners and bunk room retains the carriage’s original seats, which are 44cm high. These can be flattened using the built in mechanism to provide single beds. There is storage provided in drawers under the bed. The bunk room top bunks are 155cm high. They are accessed by a small ladder that is fixed to the ceiling. 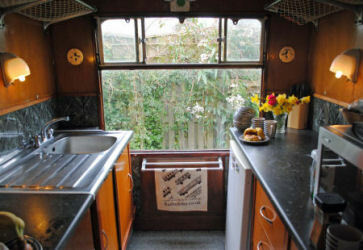 The kitchen area utilises an original compartment. The kitchen units are 99cm high and 196cm wide. The combination microwave oven and hob unit sit on top of the work surface. Glasses and plates stored in a cupboard below the work surface. Cutlery is in a drawer 73cm off the floor. There passage width between units is 70cm. The kitchen has a lino floor covering. 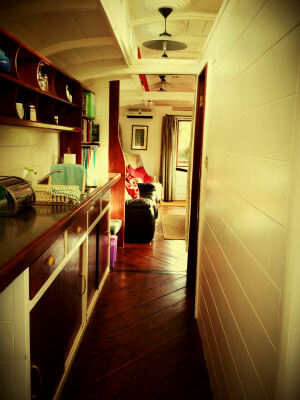 All sleeping areas retain the original wooden compartment walls and painted ceiling. The floor covering is lino. A clock radio with large digital display is beside the bed. The bed is 44cm high. 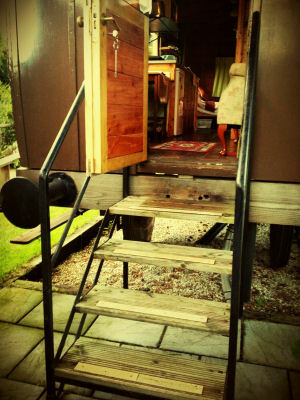 The bed in the West End has an additional bunk above it, 155cm high. In the East End bedroom there is a 53cm wide chest of drawers on both sides of the bed. in the West there is one chest of drawers on one side, and a space 53cm wide on the other. 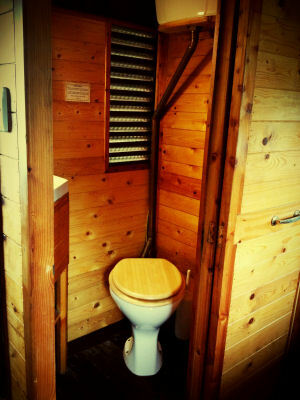 The toilet and shower doors are 50cm wide. Light is provided by a central ceiling light and frosted glass windows. The toilet and shower room have a lino flooring. A shower mat is provided. The shower and toilet rooms measure 133cm by 90cm. 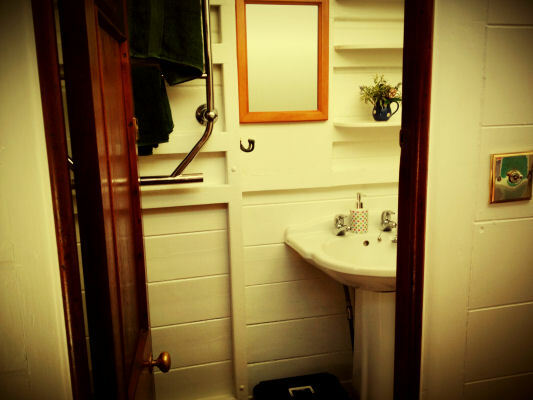 The West End shower room and toilet uses an original compartment, so is 190cm by 190cm. Light is provided by a central ceiling light, two wall lights and frosted glass windows. 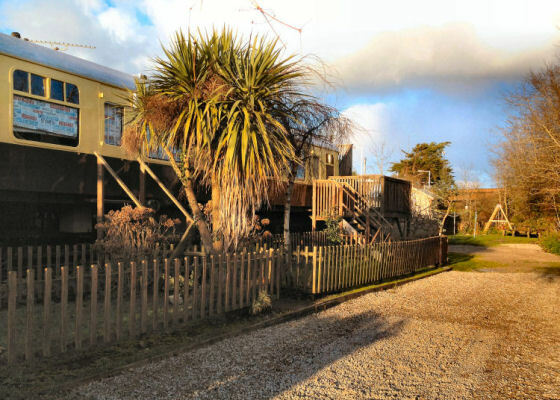 The carriage’s garden is half an acre in total. It is long and thin and divided into smaller garden areas. The main site is fully enclosed by hedges and fencing with gated access. A garden table and chairs are in place and usually stored on the wooden deck.There are decks from both the East and West Ends of the carriage. The garden areas consist of; two small fenced lawns immediately in front of the carriage. These have flower beds. There is a small patch of meadow area and a fruit tree, leading to a fenced herb and butterfly garden which is constructed around the railway track. 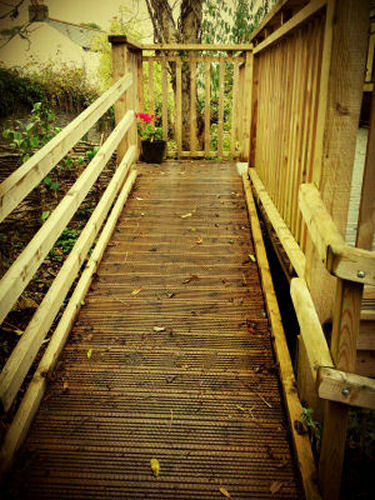 This is gated to avoid accidents as the rails and sleepers are slippery when wet. A warning sign is on the gate. There is another lawn area with beds, leading to two swings, then a wildlife garden. This is also fenced and gated as there is a drainage ditch that will fill with water after heavy rain. The entrance to the playhouse is up steep narrow steps and the door is child sized, which is fine for agile adults, but would not be easy to access for those with mobility problems. The nearest shops are 100 metres away down a steep hill. These include a Spar, Asda, baker, butcher, gift shops and places to eat. The nearest mobility aids can be hired from Truro Shopmobility, C/o Transport Department, Volunteer Cornwall, Acorn House, Heron Way, Newham, Truro, Cornwall, TR1 2XN. 01872 241813.